TV Shows – The Mentalist, Gossip Girl, Grey’s Anatomy, 30 Rock, How I Met Your Mother, Ringer, White Collar, Suits, Criminal Minds..the list goes on..
I’m a laid back, happy person and I’d love to meet anyone who shares a fondness for books! I can be found on twitter and you can also e-mail me. I am a labor and delivery nurse by night and either sleep during the day or read. The sleeping during the day must have something to do with me liking the paranormal. And housework, what’s that? I’d rather read. I also am a mom of 4 crazy kids and a wife to a crazy husband. Send me an e-mail to talk more about books, and other things! I will read almost anything. Almost. 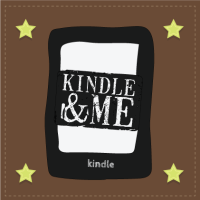 The Kindle & Me... The ramblings of a compulsive reader.